Cinematographer Buddy Squires, ASC on Following his Instincts in "Compassion in Exile"
Cinematographer Buddy Squires, ASC on following his instincts in "Compassion in Exile: The Story of the 14th Dalai Lama." From Sight, Sound & Story: The Art of Cinematography on December 6th, 2017. Buddy Squires, ASC is an Oscar nominated filmmaker, an Emmy Award winning cinematographer, and a member of both the American Society of Cinematographers (ASC) and the Academy of Motion Picture Arts and Sciences. His more than 200 screen credits include two Oscar winners, seven Academy Award nominees, and ten Emmy Award winning productions. Personal honors include thirteen Primetime Emmy nominations with one Emmy Award. Squires also received the Eric Barnouw Award, a Crystal Heart Award, a Christopher Award, and a Golden Lens Award. His work is regularly featured at the Sundance, Telluride, and Tribeca Film Festivals. The Los Angeles Times praised Squires’ cinematography as “gorgeous… astonishing camera work.” Time Magazine has called it “visually amazing”. The International Documentary Association cited Squires’ “visual poetry” in awarding him their 2007 Outstanding Documentary Cinematography Award. DP Igor Martinović on Natural Light and Authentic Locations in "The Night Of"
Cinematographer Igor Martinović on using natural light and authentic locations in "The Night Of." From Sight, Sound & Story: The Art of Cinematography on December 6th, 2017. Igor Martinović is a New York based cinematographer of feature and documentary films as well as TV series and commercials. He photographed the Academy Award winning documentary "Man on Wire," directed by James Marsh, which also won a BAFTA for Best British Film, the Sundance Grand Jury Prize and Audience Award and the Independent Spirit Award for Best Documentary. His other docs include "Keith Richards: Under the Influence" directed by Morgan Neville and "Wormwood" directed by Errol Morris. Igor was nominated for Emmy Awards for his work on the Netflix/David Fincher TV series "House of Cards" and for the documentary "What Happened, Miss Simone?" directed by Liz Garbus. Other work of note includes the Sundance Grand Jury Prize winner "Sangre De Mi Sangre;" "Red Riding: 1980" also with director James Marsh; "Sunlight, Jr." directed by Laurie Collyer starring Naomi Watts and Matt Dillon; "Wallander" starring Kenneth Branagh; and two Heart Of Sarajevo winners - "Fraulein" and "Buick Rivera." Igor recently won the American Society of Cinematographers Award for his work on the HBO/Steven Zaillian mini-series "The Night Of." Cinematographer Julio Macat, ASC on Filming the Church in "Home Alone"
Cinematographer Julio Macat, ASC on filming the church in "Home Alone." 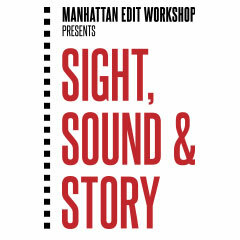 From Sight, Sound & Story: The Art of Cinematography on December 6th, 2017. The first film shot by Julio Macat, ASC, was the huge box-office hit "Home Alone." He then went on to photograph "Home Alone II," "Ace Ventura: Pet Detective," "The Nutty Professor," "The Wedding Planner," "Cats and Dogs," "Bringing Down The House," and "Wedding Crashers," all of which opened to the #1 box office position in the US. The total domestic box office receipts of the films he has photographed is over $1.7 Billion. His extensive credits also include the features: "So I Married an Axe Murderer," "My Fellow Americans," the remake of "Miracle on 34th Street," "Because I Said So" and "Smother," both with actress Diane Keaton, and the action picture "Ballistic: Ecks vs. Sever." In moving away from comedy to more dramatic work, Macat was asked by first-time director Antonio Banderas to photograph his directorial debut "Crazy in Alabama" with Melanie Griffith, and Adam Shankman to film his coming of age drama "A Walk to Remember," as well as "The Wedding Planner", and "Bringing Down the House." On another fifteen occasions, Macat guided the directorial debuts of Jason Moore, Aram Rappaport, Tom Shadyac, Raja Gosnell, Vince DiMeglio and Larry Gutterman among others. Macat has photographed the dramatic films "Moonlight and Valentino," "Only the Lonely," and the Morgan Freeman heist drama "The Code," directed by Mimi Leder. In comedy, he has also shot "Blended," starring Drew Barrymore and Adam Sandler, "Daddy’s Home" with Mark Wahlberg and Will Ferrell, "The Boss" and "Life of the Party" both starring Melissa McCarthy, as well as "Middle School" and the upcoming "Daddy’s Home 2." About Our Sponsor: The ZEISS Group develops and distributes semiconductor manufacturing equipment, measuring technology, microscopes, medical technology, eyeglass lenses, movie and camera lenses, binoculars and planetarium technology. It emerged from a workshop for precision mechanics and optics which was established by company founder Carl Zeiss in the east German city of Jena in 1846. Today, Carl Zeiss is headquartered in Oberkochen in the southwest of Germany. 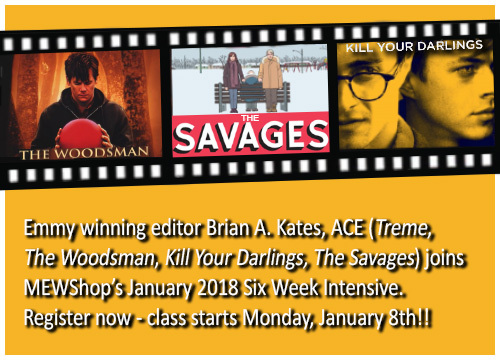 Next Six Week Intensive Art of Editing Workshop Starts January 8, 2018! Whether just starting out in a new career, switching gears from an old one, or pursuing your own creative goals; the Six Week Intensive helps you develop the practical tools you need every day and the foundation of your voice as a visual artist. 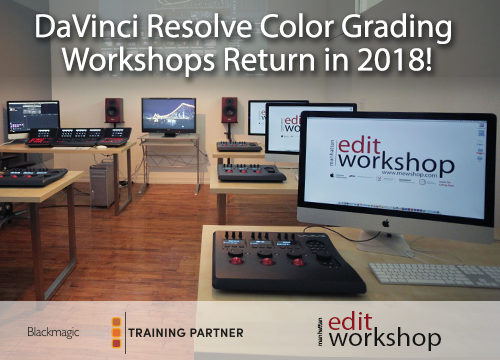 Our Six Week Intensive Course in the art and technique of editing is a comprehensive jump-start for anyone serious about a career in post-production. ITV America (LeftField Pictures), is a reality television powerhouse with hundreds of hours of cutting-edge and innovative unscripted programming, airing on various major networks. Upon completion of the Six Week Intensive program, students will be given the opportunity to submit cover letters and resumes for paid post-production internships at ITV America (LeftField Pictures. 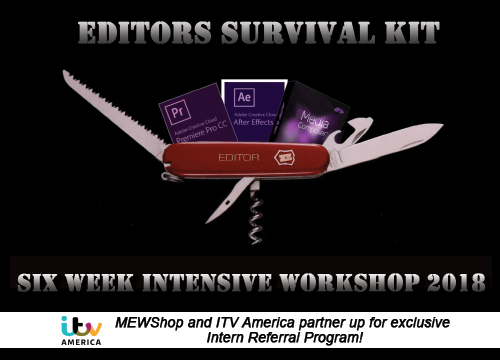 )* During the workshop, students will also get the opportunity to tour ITV America (LeftField Pictures) and meet Post Production Supervisors. Our next Artist in Residence is Emmy winning editor Brian Kates, ACE ("Treme," "The Savages," "Lee Daniels The Butler")!! January 08, 2018 - February 16, 2018 - 5 Spots Remaining!